This is someone’s first time on a board – I love it. 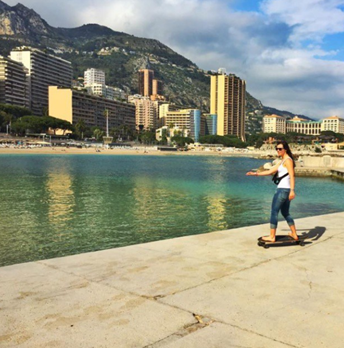 I love that she did it because really getting on a piece of wood with four wheels and no brake or steering wheel – that’s scary! And I love that someone was there to help her. I’m sure people can teach themselves skateboarding – I’ve seen people watch videos and learn how to do tricks. I just like the idea of having help. How did you first learn to skateboard or what was something bugging you for a while until you just did it? Share those pictures and stories of what you did to get or keep skateboarding – that’s inspirational not just to me but many other skater girls. Never underestimate the importance of friendship. They say new friends are silver and old friends gold. I say a true friend is diamond. Absolutely love this picture of Olivia aka lilmissgardner and the caption “Riding with my Besty”. When I first started skating it was hard making girlfriends – there just weren’t many girls – I’m grateful for more girls at the skate park. And I guess I have to thank skateboarding for “forcing” me to meet all kinds of new people. I used to be terrified of new parks, new anything – now I’m ok especially when I can face new with a friend. Friendship is always in style – be authentic & true on and off the board. 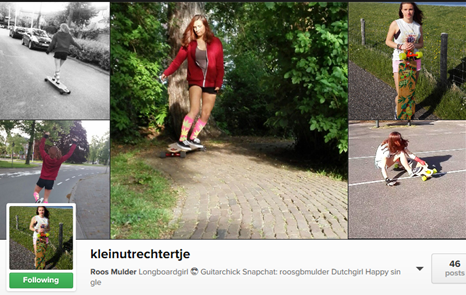 Happy Monday from Roos a Dutch Skater Girl with some rad socks. We all know my geography is sketch but my fashion is on point and I love those socks and her style. I read a Mandela quote today: May your choices reflect your hopes not your fears. This picture absolutely reflects my hopes of when girls skateboarding around the world is taken for granted. 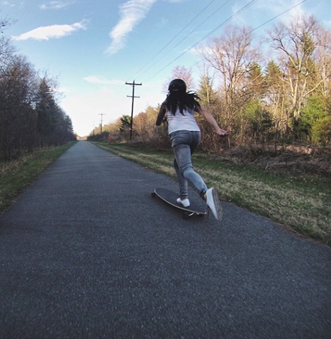 To all the pioneers before us and all the girls like Roos sharing pictures now – skate strong, have fun, and inspire others to skate with you. I love Kimberly’s post and I hope others just go with a feeling and pick up a skateboard. 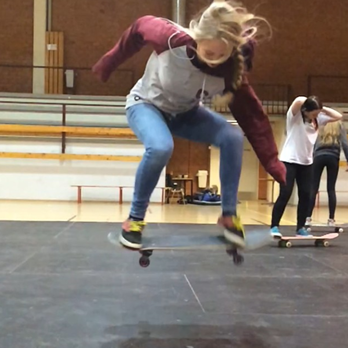 It doesn’t matter if you don’t know why you have a feeling to skateboard – just try it. LOL you can always quit but at least you’ll know you tried it. Keep an open mind on and off the board – it’ll keep you stylish! 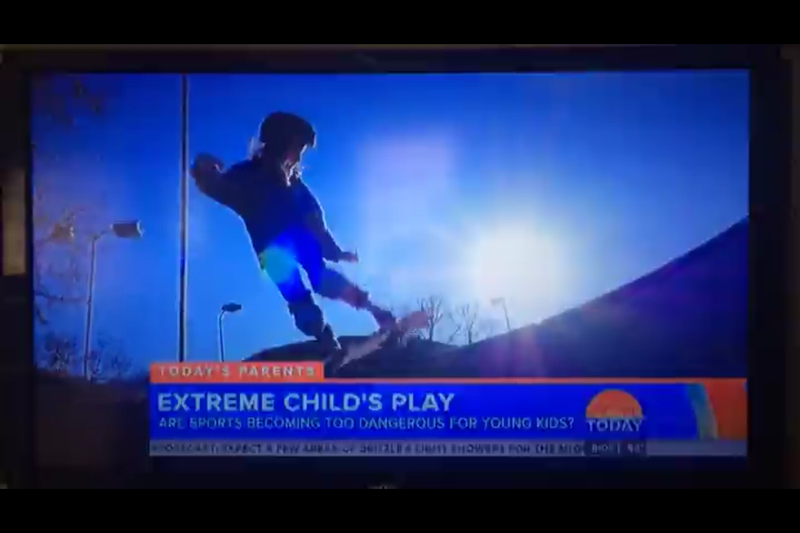 If you missed yesterday’s Today show you missed my sk8 sister Minna! I’m so happy for Minna and for all girls because when girls see girls having fun skating – more girls skate. The Today show is an icon with tons of viewers. Imagine how many girls got inspired to try skating. Minna has inspired me since day 1. 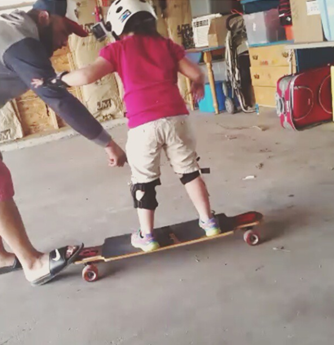 No I’m not going down any mega ramp soon – she encourages me to do my personal skate best. The 6th Annual Skateboarding Hall of Fame and Icon Awards Induction Ceremony happened yesterday, May 14, 2015 at the Westin South Coast Plaza Hotel in Costa Mesa, CA. I was lucky enough to attend. Real quick if you don’t know Skateboarding has a Hall of Fame – which I didn’t till about a week ago – check out their page. Of course I loved it because it was dressy – in the evening at the Westin. No worries – the fashion review is over. And there were too many vegetables for my liking so I’ll skip past the dinner review and go to awards. The night was a history lesson. Shout out to my mom who drove me in the rain and to whoever made the program, my mom read it cover to cover and took it home. I think it’s important to share skateboarding history because many people are like my mom – all they “know” about skateboarding is what they’ve seen in the mainstream media. The big take away messages for me were the need to be professional on and off the board, the creativity that skateboarding allows you in skating and the creation of skate products, women skaters inspire all skaters, skate for the love of it, and that without other skaters no one would be there. So till next time, keep it stylish on & off the board and be grateful fashion has evolved since the 70s. This is Caty and she’s keeping it stylish in Norway. She’s a team rider for asfreestyle who’s aim is to promote happiness for board sports and free ski. 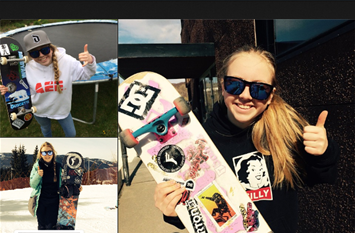 Caty’s a triple threat – she sk8, snow sk8 and snow boards. The picture of her wearing a Silly Girl sweatshirt jumped out at me. 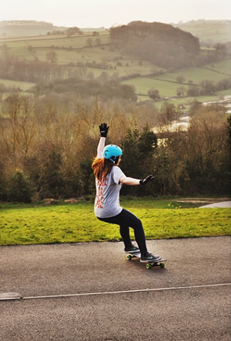 Silly Girl is local up the coast from me and here is Caty from Norway rockin their logo! seem like next door. Yes I googled it – over 5,000 miles and a different language yet I connect with Caty because of skating and fashion. I’ve said I can spot a rad skate spot – well dag_ontheway actually goes there. Her bio does not lie: See, experience, feel as much as possible! She’s got skate pictures in places like Cannes, Monaco, La Palme, Verona, Vien, Passe Rolle, Verona, Vien!
. . . my mind is on skateboarding around the world! And as always, my mind & actions are on getting more girls skateboarding for fun! 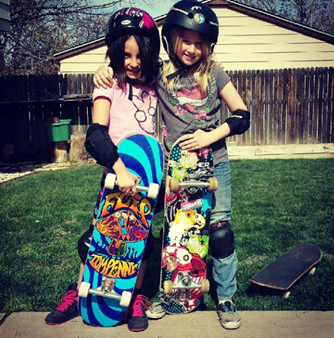 Keep sharing your fun skate pictures – they inspire! I’m not great with geography – however, I know when a place looks cool. This is Lyndsay from Scotland living in the Peaks – which may or may not mean she’s skating in Scotland. I know this is a rad photo even if I’m clueless about exact location. What I do know is there are peaks throughout the world and girls throughout the world skating them. Ok maybe not me – I’m more a park girl – but never say never maybe my Whiskey board needs a sister. Never have too many sisters or too much motivation to try new things. Keep sharing those pictures together we inspire each other on & off the board. 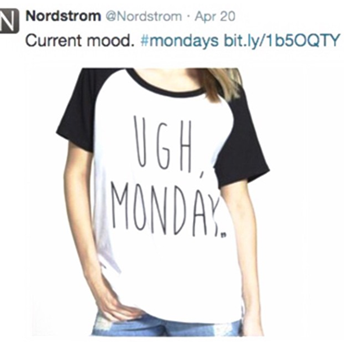 Why do you say UGH, Monday – I do because it’s back to school which interferes with my skateboarding, shopping, and Netflixing activities! But soon – just FIVE more weeks for me and its summer vacation, till then this shirt by Boy Meets Girl is my Monday uniform. Keep it stylish on & off the board – knowing there is more time on the board coming this summer – get your outfits ready now. If you’re going to a skateboard camp – remember to take pictures and share them here – more girls do skate when they see girls skating and having fun. I’ll be at Woodward West for Girls Week – June 28th – July 4th and I’m planning on volunteering at some camps around San Diego – details on that coming soon. Don’t worry if you’ve never been on a board or are just starting – skate camps are great places to meet other skaters, have fun, and learn some skills – yes even on Mondays!